There was a thin film of oil for two nautical miles along the Kamarajar Port after an LPG tanker and an oil and chemical tanker collided. CHENNAI: There was a thin film of oil for two nautical miles along the Kamarajar Port after an LPG tanker and an oil and chemical tanker collided within the port limits in Ennore early Saturday morning. 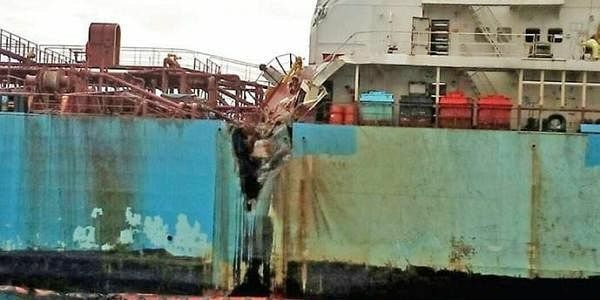 Kamarajar Port chairman MA Bhaskarachar said the LPG vessel, BW Maple, Isle of Man flagship, collided with the Indian vessel MT Kancheepuram, an oil and chemical tanker at the outskirts of the port in Ennore at 4 am. The incident happened about two nautical miles outside the harbour. Bhaskarachar said there was no damage to the environment like oil pollution. He said an enquiry had been ordered to find out the cause of the accident. Coast Guard officials in Chennai said they were assessing the situation. “Our vessel is on the way to provide any assistance if any required. But Kamarajar Port has the wherewithal to arrest the spill, which is a minor one,” said a Coast Guard spokesperson. Both vessels were afloat and anchored, and the accident did not affect the movement of ships, added the port officials. Express that they had stationed a ‘containment boom’, a temporary floating barrier used to contain oil spills. Booms are used to reducing the possibility of polluting shorelines and other resources and to help make recovery easier. The Coast Guard said the spill would be contained by Saturday evening or Sunday morning.